Foxhole friendships are often the most enduring. Claim adjusters experience lots of stress and pressure. No man is an island, nor is any claims person. Often, the friends you make in your fellow claim associates grow into something more and forge strong bonds. We work not just for paychecks and job stability, but also as an ancillary benefit sometimes develop close friendships with colleagues. Vendors become more than just service providers. Co-workers become more than just business associates. Today, I depart from my usual “Claims Coach” commentary on loss adjusting topics. I know that in business, we’re supposed to blanch emotion out of the recipe. Button-down, stiff upper lip. Emotions play no role in the rational decision-making governing business decisions! However, today I learned of the passing of a longtime friend and claims colleague, Dave Bauer, who had a 40+ year career with GAB Business Services. In my 22 years there, I knew Dave as a resourceful and creative claims professional. He had no interest in the burdens and headaches of being a claims supervisor or manager. He had no stomach for the politics and positioning of working in a Home Office. He was instead a technical virtuoso in getting claims settled and moved along. Despite his gruff exterior, he was a kind man with a wry sense of humor. An ex-Marine, Dave listed his educational pedigree as being a student at the School of Hard Knocks, University of Life. He was a no-nonsense guy with an unerring BS-detector, able to smell a manure pile from a mile away. One of my first exchanges with Dave was at the DRI Drug and Device conference in Coronado, California in May 1989 at the Hotel Del Coronado. Dave and I did a joint presentation to defense attorneys on our fledgling claims program, trying to interest them in working with us. The audience was packed and standing room only. While I expected little from the droll old dude sitting beside me, Dave blew me away, had me doubled over in laughter by his deadpan but extremely effective and funny delivery of his message. He had a way with defense attorneys that came across as abrasive and abrupt, but was effective and to-the-point. He sounded just like the guy in the Motel-6 ads who says, “We’ll keep the lights on for you …” His presentation was lights-out! Thereafter, Dave and I often presented together at conferences. Dave often teased me later that, whenever he spoke, I’d have a stopwatch on him to ensure he kept to our agreed-on time allotment. I gently corrected him, saying that when he spoke, I didn’t use a stopwatch but instead substituted a calendar. That was classic Dave Bauer. Eventually, Dave retired but I still kept in touch with him and he with me. When you’re in a corporate world and then leave it as I did two years ago, you find out who your true friends are. Many people who sought you out, hung on every word now treat you as The Invisible Man. And to them, you are. You are no longer a source of business. You are no longer a client or a prospect. You are in that netherworld of anonymity. When you leave a corporate setting and set out on your own, you learn who your true friends are, the people who value you for the relationship itself, who don’t just see you as a source of business and referrals. Dave was one of those people. Our relationship morphed from a business exchange to a close friendship. He was one of the most creative claim professionals I have known in my three-plus decade career. (Once, he included the offer of a bass-boat to get a claim settled with an avid fisherman. In another, he offered a donation to the claimant’s church.) But beyond that, he was a terrific husband, father, and grandfather. I will remember Dave not just for his claim prowess. I will remember him for his love of being at the racetrack and betting on the horses. 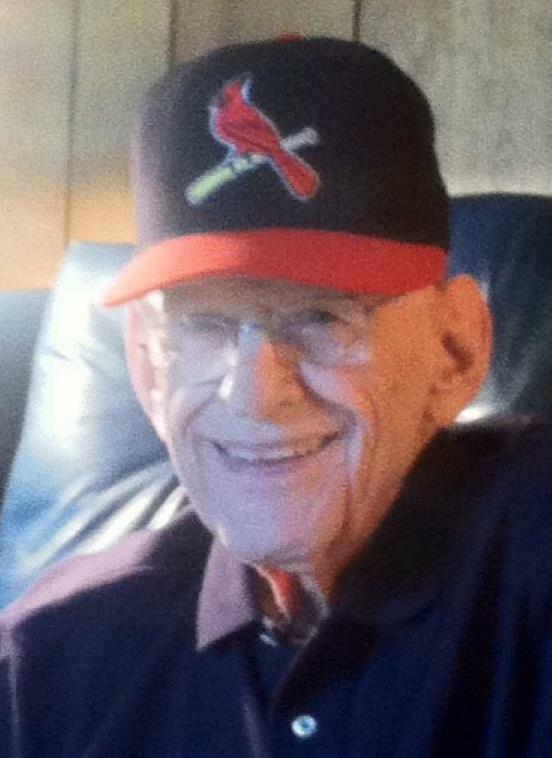 I will remember him for his passionate devotion to the St. Louis Cardinals. He was a blue-collar, lunch pail kind of guy without pretension, an ex-Marine who — despite his gruff exterior — was a kind and friendly man. At 80-some years old at the end, Dave had a great run and a full life. In recent years toward the end of the line, he suffered a succession of health problems. I used to kid him that his medical insurance guidelines did NOT entitle him to his demand that nurses give him three sponge baths a day. .. I am honored to have worked with him and to have known him. Though I shed tears at the news of his passing, I rejoice in his life and the legacy – – both professional and personal — that he leaves behind in the lives of those he touched. For those of us who had the privilege of working and coming to love Dave Bauer for his dedication to his craft and his wonderful sense of humor, his passing means more than just another obituary one reads in the local newspaper. Words can’t describe how wonderful this gruff old guy was–and he would be embarrassed to read the words of praise so many will express about him in the coming days. He was not one who stood for ceremony, not one who would suffer fools, not one who would accept “average”. He was the very best in the business besides being a great husband and father. Many of us who called him our friend lost a great one last night.